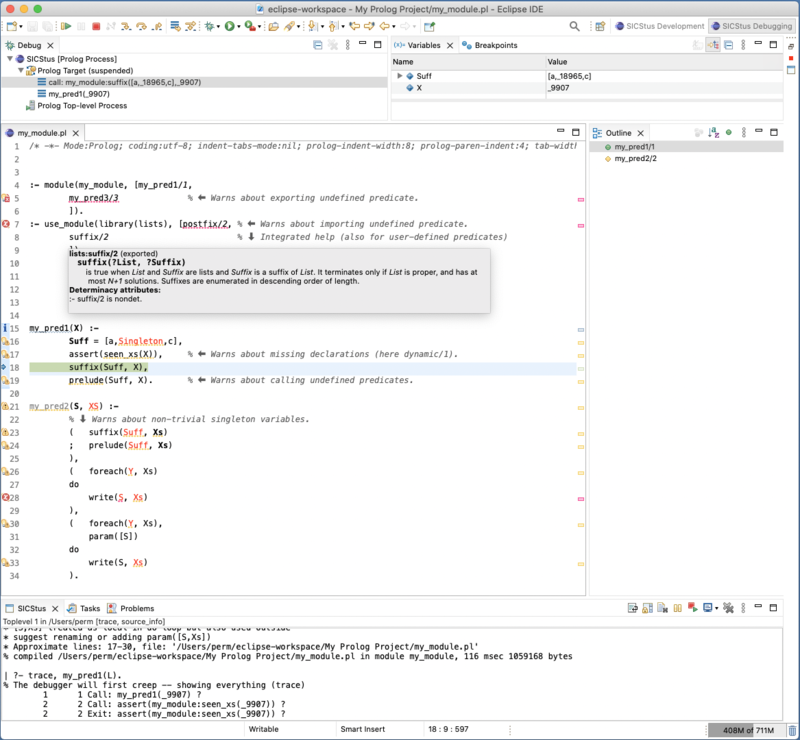 SPIDER is the new SICStus Prolog IDE, based on Eclipse. It is currently in public beta but already quite useful. The latest update was in April, 2019. See the instructions on how to download and install SPIDER. Once you have installed SPIDER, you can proceed to create your first Prolog project with SPIDER. SPIDER Getting Started describes how to create a simple Prolog project as well as how to use some of the SPIDER features. Information for SPIDER Beta Testers contains information about the kind of feedback we need from our beta testers. Tips and Tricks contains information about how to best use SPIDER. Known issues contains information about various issues in the current beta release. Release History contains information about releases. Some of the features are described below. See the Release History for more details. Information about missing and future features is available in the Information for SPIDER Beta Testers. The editor flags things like calls to undefined predicates, unreachable predicates, incorrect use of predicates and directives, missing declarations … Some warnings comes with quick-fixes, i.e. automatic source-code modifications that fixes the warned about issue. Problem markers are enabled also for Prolog code that is not open in an editor. Related information, like mode/1 and block/1 directives and various inferred information (determinacy, output arguments) are also shown. It is also possible to manually enter the name of any predicate, with completion, and go to its source code. Clicking on a predicate can bring up a tree of its callers and other references. A light weight version of this command that just opens the closest caller of the current predicate, is also available. Predicates are analyzed, on-the-fly, for potential non-determinacy or non-termination. Predicates are analyzed, on-the-fly, and likely output arguments are shown when hovering over the predicate in a goal. Predicates can be accurately renamed in an entire project. Variables can be renamed within a clause or directive. Predicates can be created from selected code, and the code replaced with a call to the new predicate (“Extract Predicate”). A call to a predicate can be inlined, i.e. replaced with the corresponding clause body. Variables can introduced from a selected term; variables can be inlined, i.e. replaced with their value. Source-linked debugging. Works also for code, like the SICStus library, that has no recorded source info. Line Breakpoints and Spy points can be added by clicking in the left margin of editor. The ordinary toplevel is still available, with input history and completion. This includes the traditional debugger interface. You can have multiple SICStus processes running, each in its own toplevel view. 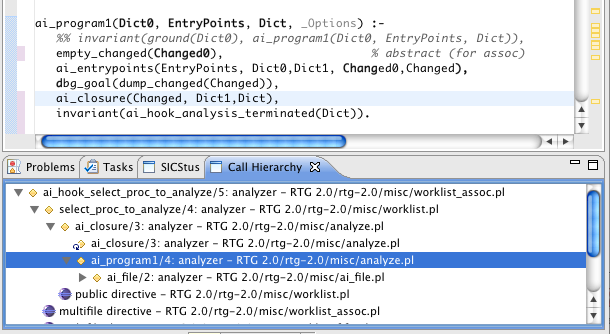 The Profile view shows profile information for code run with profiling enabled. The Coverage view view and editor margin annotation shows source code coverage information for code run with profiling enabled. This features requires SICStus 4.2 or later. Integrated SICStus Manual and other documentation.